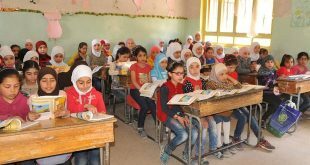 Damascus, SANA – Ministry of Education and the United Nations Children’s Fund (UNICEF) signed Thursday the joint cooperation plan of 2015 to repair damaged schools and boost primary education. 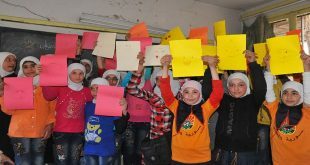 The plan focuses on improving equal opportunities to reach the Basic Education stage at schools and reducing school dropout rates, particularly for the children affected by the terrorism crisis in Syria. After the signing ceremony, Minister of Education Hazwan al-Waz said in statements to reporters that the plan will work on rehabilitating a number of schools along with their sanitary facilities and providing prefabricated classrooms and the necessary furniture and school requirements. The UNICEF will also cooperate with the Ministry in printing and distributing school textbooks, developing self-education methods and early childhood education systems and enhancing the educational clubs, al-Waz added. The Minister noted that the joint plan includes in some of its programs work on enhancing social and psychological support and raising health and protection awareness. UNICEF Representative in Syria Hanaa Singer said the plan includes maintaining and rehabilitating 600 schools in most needy areas. In a meeting between al-Waz and the earlier this month, the Minister said the ongoing terrorist war has caused the education sector losses of SYP 170 billion and left around 500 children dead. 5,000 schools are out of service, up to 600 schools are used as makeshift centers hosting displaced families, according to the Minister, who noted that the number of schools that are currently in service is 17,000 accommodating 4.300 million students.